It’s an annual tradition in the Joyce Center parking lot. It has its own website. It’s been featured on a CNN story about tailgating, as well as a CBS College Sports Network show. An annual invite goes out that “at least tries to be funny” and typically attracts close to 200 attendees. 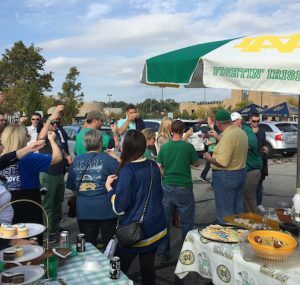 It’s The Admiral’s “Uber Tailgater.” And like to many traditions at ND, it started small. Among the former ND managers who form the core of The Uber — from left to right, including their senior manager sport – Joe Frericks (Women’s Soccer), Michael Kuharich (Baseball), Joe Palmer (Men’s Basketball), Marc Wolnitzek (Football Equipment), Steve Hodapp (Golf), Pete Byrne (Hockey), Rachael (Mahon) Springman (Men’s Tennis), Scott Springman (Head Football Manager), Jen (Hyduk) Byrne (Women’s Basketball), Leigh Ann (West) Kerns (Men’s Basketball). Many of the initial group of managers had siblings who attended ND and some were student managers themselves, and the network of the Uber continued to grow with their friends, families and roommates over the years. 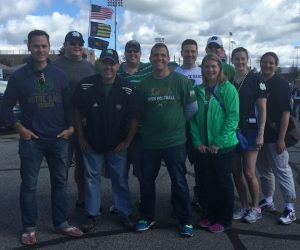 Marc also got more and more involved with the Notre Dame Club of Cincinnati, so friends from that organization started to attend, as well as friends of Marc’s parents (dad Steve is class of 1970) and their network, many of whom have been going to ND games for decades. Some of Marc’s work colleagues from all over the country have attended as well. Over the years the crowd has grown and this year The Uber had over 150 people in attendance. Katie Wolnitzek’s unique Stadium Cake for The Uber. The food is almost all from Cincinnati and/or northern Kentucky; so many people have been introduced to a cheesy-mett along with the specialty of Marc’s mom, Katie Wolnitzek — her famous Cincinnati-style potato chili. 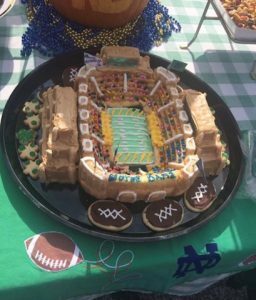 Katie’s meticulously designed stadium cake has become popular as well and is a particular hit with the growing legion of little kids now in attendance, along with her expertly-decorated cookies. “My mom puts a tremendous amount of work into the preparation for the whole day and it certainly wouldn’t be an Uber without her and the help I get from my family and some in the group, particularly with the setup and loading/unloading of the cargo van,” Marc notes. One of the more notable annual traditions at The Uber is the B-52 toast that is done around three hours before kickoff. The toast started at the 2003 Uber and carried over a tradition from the now much-missed Maury’s Pat’s Pub, which had been a favorite football weekend gathering spot for family and friends and traditionally featured a similar toast to end the meal.